The soundtrack for RWBY Volume 5 came out on iTunes yesterday, which means all I’ll be listening to for the next few weeks is Jeff and Casey Williams’ exhilarating metal tunes. The fifth season for Rooster Teeth’s anime-styled action series finished airing a couple months ago, and like many fans it left me fairly underwhelmed. The show has always had its flaws, but a lot of the qualities that the series has going for it seemed to be lacking in the latest volume. Despite the quality inconsistency on the writing and animation fronts, the soundtrack for Volume 5 remained as fantastic as the other four. That’s no surprise, no matter what missteps the series makes the music has always been there to prop up the experience. I should say right out of the gate that regardless of its objective quality, I love this show. Like, really love it. I may or may not have Ruby Rose’s symbol tattooed on my shoulder. But if you really love something, you should be able to understand its flaws. And RWBY has plenty of those. The first episode in particular is incredibly cringeworthy, in fact it can be difficult to recommend the show to anyone thanks to its lackluster first season. However, once the episode ends you are treated to an opening set to Jeff Williams’ This Will Be the Day. Holy hell this song gets me pumped up. There’s something so satisfying about that guitar. It feels so tangible, like you could take a bite out of the music itself. I was hooked on the entire series the moment I saw that opening, even if I had been rolling my eyes at the previous ten minutes. I will never get tired of listening to this song. All five of the RWBY openings are amazing, but Mr. Williams doesn’t stop there. Every season there are five or six new songs that tell stories from a character’s perspective or describe the general mood of the show for that volume. Examples include Like Morning Follows Night, a duet between two characters frustrated at each other’s stubbornness, and Smile, a painful glimpse into the mind of a girl who is forced to hide her true feelings. These songs serve as poignant background music for the more dramatic scenes in the show, but also enhance the series simply by existing. Bmblb, for instance, seems to be a song directed at fans who ship two of the main characters. The tune doesn’t show up in the series, but it’s a fun “what if” scenario in the form of a cute love song. It’s completely unnecessary to even create such a thing if it isn’t used in any scenes, but it shows just how much the creators care about their community. And that’s who really benefits from the excellent music. Communities built around particular series are much stronger when there is something to hold onto beyond the series itself. It could be cosplay for excellent character design, an addictive line of collectible merchandise, or, indeed, a memorable soundtrack. 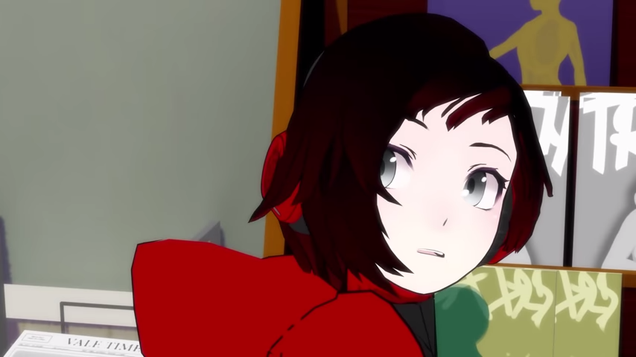 RWBY fans can discuss plot threads and character relationships like with any other show, but they also get to sing their favorite character’s anthem or dig into different interpretations of the lyrics. RWBY may not be the best show, but thanks to its soundtrack it’s a damn good one.